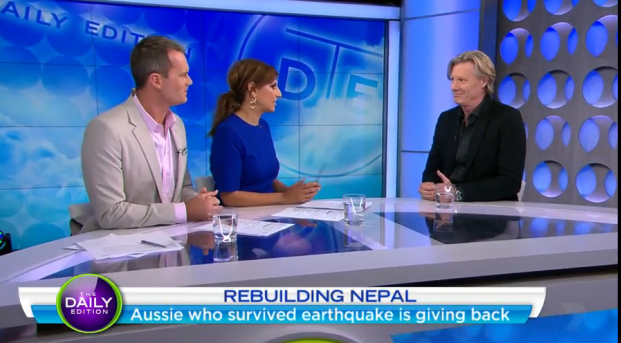 On Wednesday Neill Johanson was interviewed on Channel 7’s, The Daily Edition show about his experience in Nepal at the time of the ANZAC earthquakes and Davenport Campbell’s pledge, Climb for Education. In the year since the ANZAC earthquakes, Davenport Campbell have been working alongside the Australian Himalayan Foundation to rebuild schools and get children back to school in the areas devastated by the earthquakes. Our architects have volunteered their time to designing earthquake proof class rooms to help rebuild the damaged schools of Nepal. Our designers have sent 80 kilos of art supplies to the Khumbu region to help with the post-traumatic stress programs being run by various NGO’s. Please join us to help make a difference to the lives devastated by the Nepal earthquakes. It costs as little as $50 to supply the children with books and school supplies and $200 to send a child to school for the year. Visit Climb for Education or The Australian Himalayan Foundation to make a donation. You can also visit DC Nepal Page to stay up to date with the progress of the rebuild in Nepal.